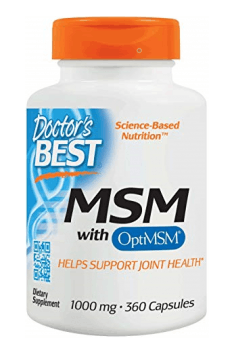 Doctor’s Best Best MSM is a top-quality dietary supplement with methylsulfonylmethane – the most bioavailable, organic form of sulphur available on the market. It is manufactured as convenient capsules which allow you to deliver an effective dose of the compound with a broad spectrum of anti-inflammatory and antioxidant properties. Methylsulfonylmethane (MSM) is a derivative of hydrocarbons with a sulfonyl group. Because of that, it is a highly absorbed form of organic sulphur. It lasts long enough in the blood to produce specific biological effects. They include an improvement in skin and nail quality and a reduction in inflammation in joints and sore muscles. In addition, this compound easily crosses the blood-brain barrier and may thus act on the central nervous system. The articular apparatus is composed of three kinds of tissues – connective (ligaments and tendons), bone and cartilage tissue. As you age, mechanical stress causes slow wearing out of the hyaline cartilage, resulting in severe inflammation. This leads to joint warmth and persistent pain. This process is underpinned by the production of cytokines and prostaglandin and release of free radicals which gradually damage the joints. Individuals with inflammatory-degenerative diseases can help themselves by supplementing with MSM. Organic sulphur has been demonstrated to block the activity of the enzyme COX-2 (cyclooxygenase 2), responsible for triggering inflammation. Furthermore, it reduces levels of IL-1, IL-6 and TNF-alpha and, as a potent antioxidant, fights harmful free radicals, thereby neutralising them. As a result, there is a reduction in pain and an improvement in the function of the osteoarticular system. This significantly enhances your quality of life. Sulphur is a compound which is a component of many compounds that are vital for bodily functions. They include sulphur-containing amino acids – methionine and cysteine which are used for the synthesis of hyaluronic acid and glycosaminoglycans, widely distributed throughout the connective tissue. These proteins give the subcutaneous tissue proper elasticity. Supplementing with ogranic sulphur allows you to provide a building block for, e.g. keratin – a fibrous protein which is responsible for normal structure of the skin, hair and nails. Its deficiencies are manifested in brittle nails, split hair ends and peeling skin. There is good news for individuals doing strenuous strength workouts. A strong stimulus, such as heavy weights, causes great microdamage to muscle fibres. This is manifested in pain and discomfort during daily activities. One of the best ways to speed up recovery is to take MSM. This compound has been shown to be capable of reducing negative effects of overtraining, thereby accelerating recovery and helping you go back to hard workouts faster. Anti-inflammatory effects of MSM are also crucial to immune function. Immuncompetent cells communicate through mediators which are involved in activating an inflammatory response. Their overactivity leads to e.g. seasonal allergies. MSM can reduce their symptoms by proper immunomodulation. The organic form of sulphur may be also helpful in relieving colon inflammation and preventing lung, liver and urinary bladder damage. A reduction in free radicals and inflammatory processes may also contribute to slowing down the progression of cancer. To sum up, Doctor’s Best Best MSM is a dietary supplement designed not only for active individuals who want to aid regeneration of the musculoskeletal system but also for everyone who suffers from osteoarticular diseases or wants to reduce inflammation in other organs. Best MSM 1000mg 360 caps. Take 1 or 2 capsules 1 to 3 times daily with or without food. The formulation is designed mainly for persons suffering from pain associated with joint degeneration. It may be a good idea to combine it with a glucosamine or chondroitine supplement which have other mechanisms of action and will thus support the function of the osteoarticular system. The supplement is recommended to those who want to support their musculoskeletal system during hard workouts and for promoting immune function.